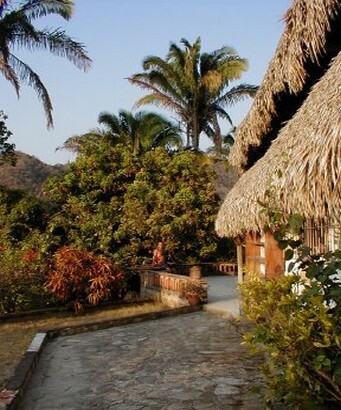 Casa Arriba sits overlooking Yelapa Bay at the southernmost tip of The Bay of Banderas on Mexico's Pacific coast. With no cars, and only accesible by a fourty minute boat ride from the lively tourist destination of Puerto Vallarta, this tranquil fishing village has retained its natural beauty and its local charm. 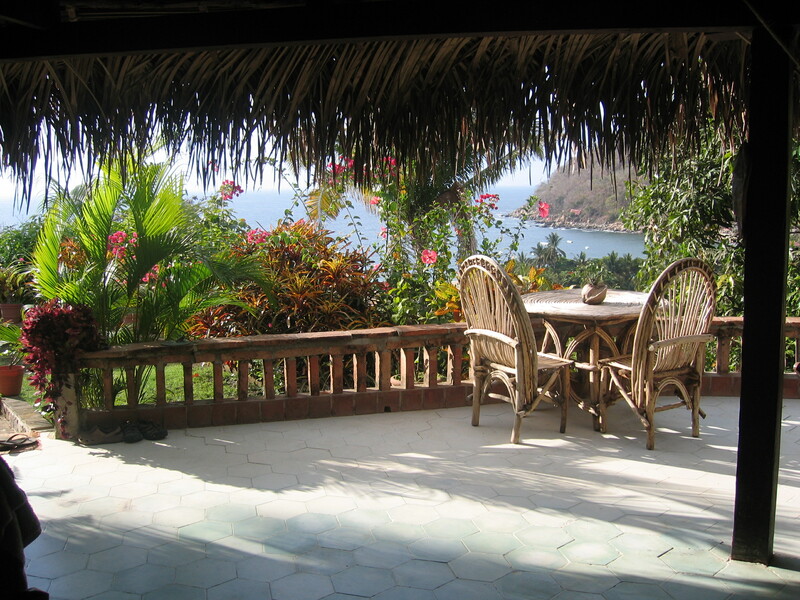 Casa Arriba's location, literally "the house above" (in center of pic, on hill above beach) ensures great views, sunsets, birds, butterflies, breezes and privacy. 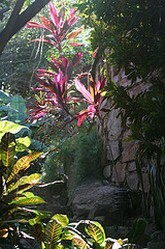 Its a short walk down to the beach or into the traditional village of Yelapa. 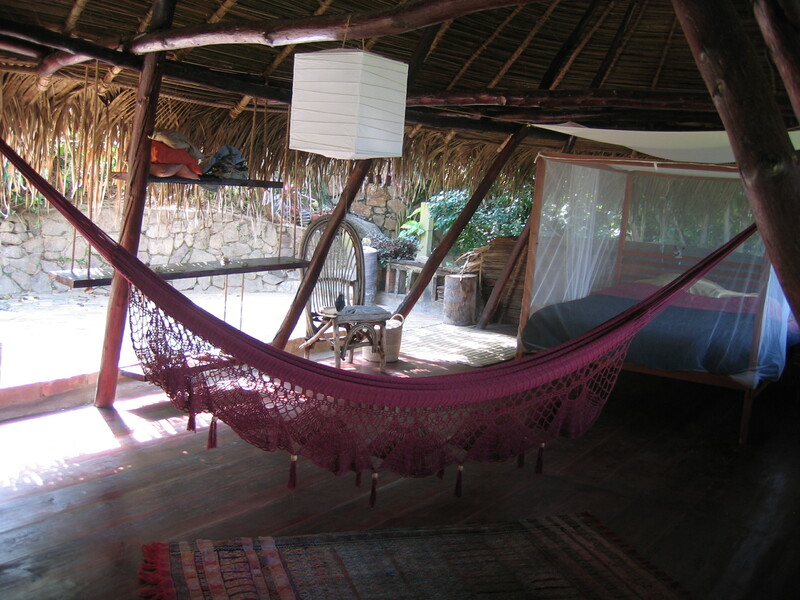 Constructed some forty years ago in the traditional palapa syle (thatched roof), Casa Arriba has been sensitively renovated after years of being uninhabited. The original design is built on multiple spiraling terraces linking shared living spaces, gardens, patios, a guest house and a seperate bano. Features include original tile flooring, massive stone walls throughout and a lot of openness to take advantage of the natural setting and views. The kitchen area has large windows looking out to the bay. It is fully equpped with lighting, a four burner stove, refrigerator, cooking and eating utensils, water purifier and ample storage space - including a pantry. All living areas of the house are wired for electricity and have dimmable lighting. There is a telephone line and high speed satellite internet wifi connectivity throughout the house. 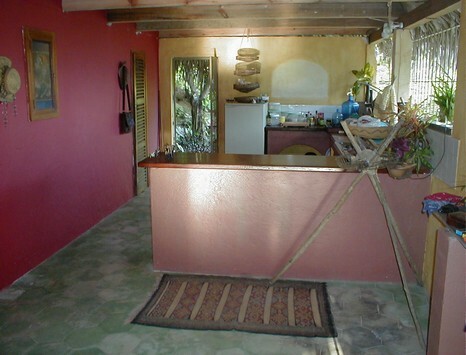 At the opposite end of the sala is the guest house (casita) with its own bathroom and hot water shower. There is currently a queen size bed downstairs and a double hanging bed on the second level. 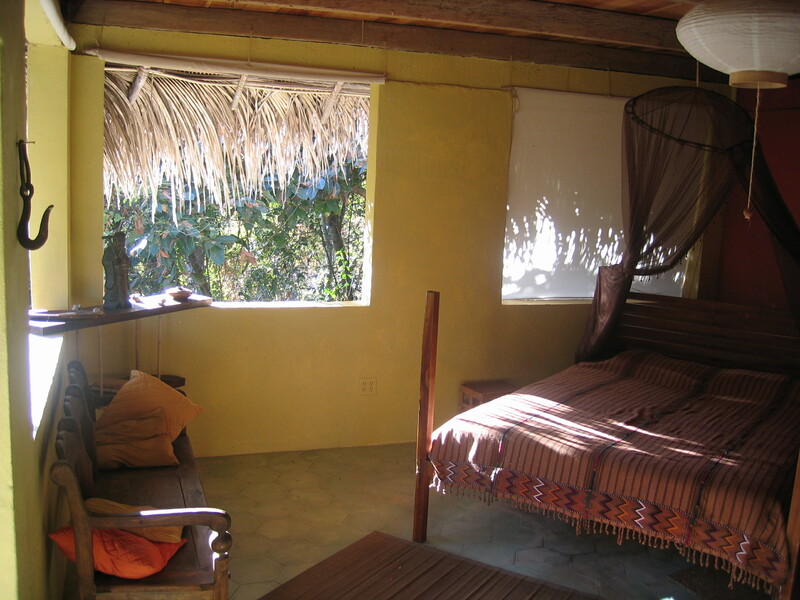 Along with the main loft/bedroom and a cozy seperate "garden room" with a double bed, Casa Arriba can comfortably sleep 6/7 people in four separate sleeping quarters, with two full baths. Further plans will create the possibility of hosting larger groups. 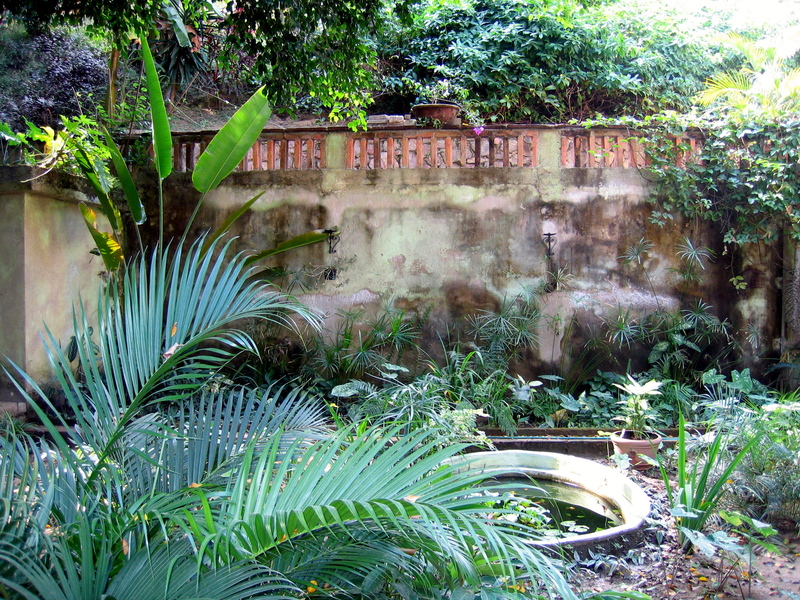 A special feature of Casa Arriba is a seperate bano (bathhouse) located above the main house with a dipping pool, open shower, toilet and original tiled sinks. It is very private with an oval terrace and another great view...the perfect place to paint, write, meditate or lie in the hammock at the end of the day. 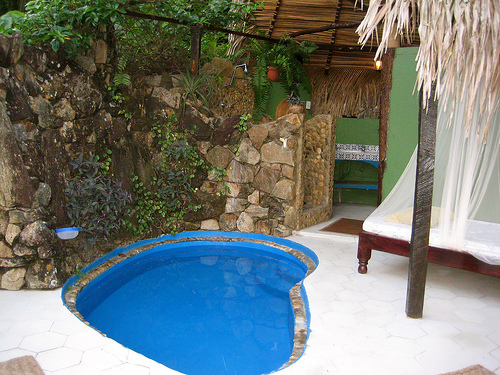 Casa Arriba is surrounded by lush gardens and terraces. 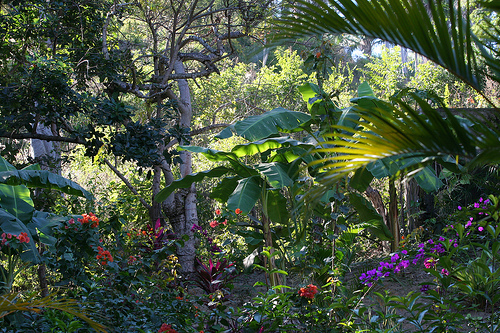 The gardens include exotic native plants such as bouganvillea in various colors, hibiscus, gingers, birds of paradise and many more; as well as fruit trees such as mango, banana, guava, avocado and lime. Thre is always something in bloom or ready to eat and numerous birds and butterflies attracted to the abundance. 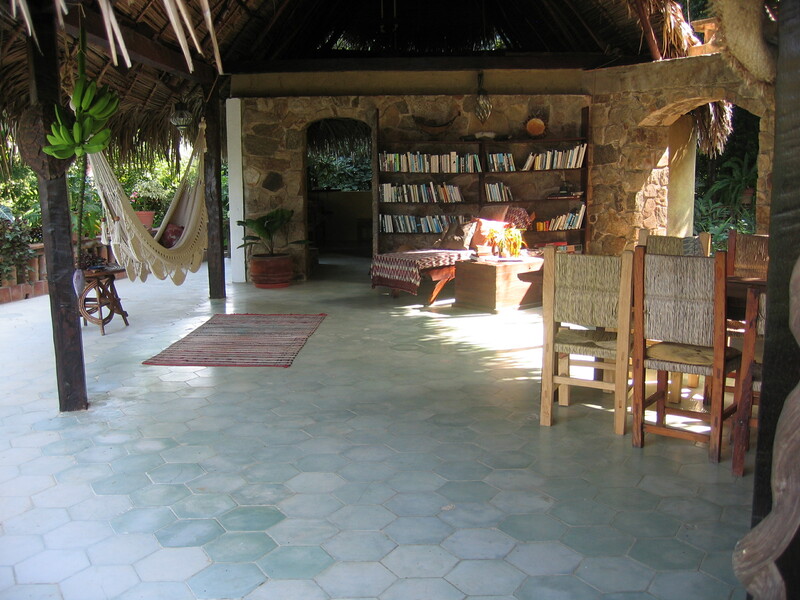 There are a wide variety of workshops and retreats taking place in Yelapa throughout the year: yoga, writing, massage, Reiki, Spanish intensives and others. More information on these can be found on the web. Yelapa's fantastic natural environment is also full of possibilities for outdoor activities: hiking the river or mountain trails, kayaking, bird or whale watching, snorkeling, fishing and boating. 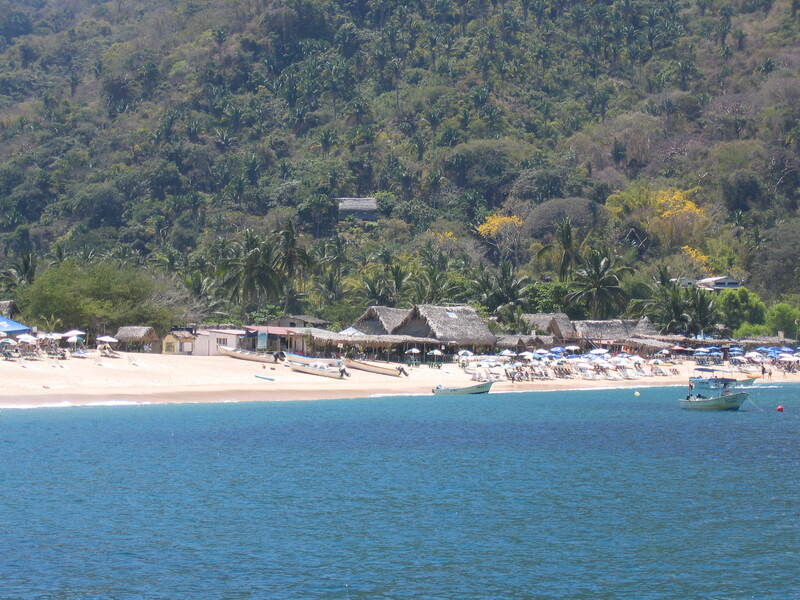 With a closely knit and integrated community of locals and open minded foreign residents and visitors, you are ensured a great time either at the beach, the disco or at one of Yelapa's great restaurants. I am currently looking for adventrous reliable handy housesitters for the off season between June and early November. A committment of at least two months and some basic Spanish preferred. Also, the house is the perfect place to host speical events or artists' retreats for individuals or small groups - painters, sculptors, writers, dancers - and you can contact me for more information on this.